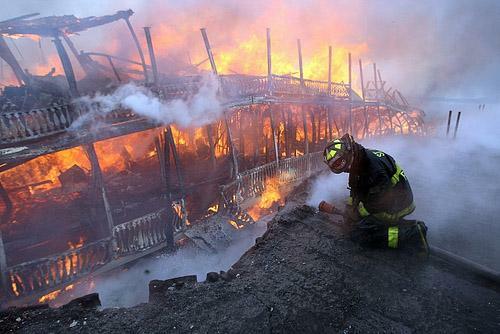 A St. Louis Fire Department firefighter waits for water as the excursion boat The Robert E. Lee is engulfed in flames at the riverfront in St. Louis on March 21, 2010. The boat was being prepared to be towed to the riverfront in St. Charles, Missouri. 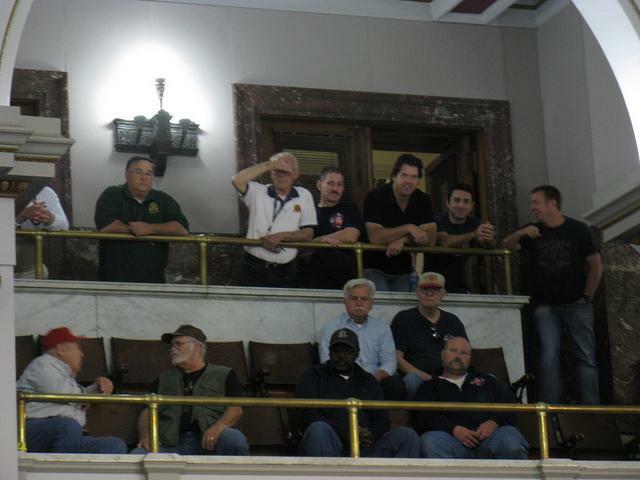 Current and retired firefighters watch the Board of Aldermen debate reforms to their pension system on April 16, 2012. Updated at 3:35 following actions by committee. Attorneys for the Trustees of the Firemen's Retirement System of St. Louis announced today that they've filed a five-count lawsuit against the City of St. Louis regarding the ongoing pension issue. The groundwork for the suit was laid back in April, when the St. Louis Board of Aldermen voted to opt out of its current system and the Trustees authorized a lawsuit, though it was unclear, then, when it would be filed. The suit filed today asks for a temporary restraining order and an injunction which aim to stop Mayor Francis Slay's plan to halt the current system. The release sent out today by the FRS' attorneys says the suit is designed to: "prevent the implementation of ordinances and to stop proposed ordinances (in the form of Aldermanic Board Bills) which together are referred to in the lawsuit as a 'Scheme' to wrest control of FRS from the state, as well as change terms and benefits FRS provides to firefighters." So which bills and ordinances are we talking about here? Remember that bill passed by the Board of Aldermen back in April? Well, today's suit says that it, along with proposed Board Bill 11, "violates the St. Louis City Charter and state statutes in that it attempts to prevent the FRS Trustees from challenging the city’s restructuring of FRS." "We believe that the procedure that’s established currently requires the city to get enabling legislation in Jefferson City and then pass that identical legislation back here in St. Louis. That’s the way the plan’s worked for 50 years, and it hasn’t been a problem up until now," said Bruce Williams, an FRS trustee. Board Bill 12, which establishes a new retirement plan, cleared the Public Safety committee on Tuesday by a 7-4 vote. "We're passing a broken bill," said Ald. Jeffery Boyd shortly before the roll call. 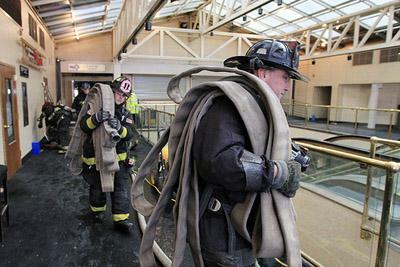 Aldermen approved amendments that ensure that if a firefighter has remarried, the so-called "death benefit" is awarded to the surviving spouse, not any ex-partners. Over the objections of the Slay administration, the committee also approved an amendment deleting language that aldermen said created even more uncertainty about the plan. But despite initial approval, members held off on a measure that would reinstate cost-of-living adjustments (COLA) for firefighters who were disabled when salaries were much lower. Though everyone agreed that the language in Board Bill 12 could reduce the disability benefits paid to some of those firefighters, the amendment would have required an actuarial study, delaying final action on the measure until September. The reversal left Ald. Antonio French fuming. "To limit the COLA for those who wind up paralyzed, or unable to sustain themselves or their families because they were in service to the city of St. Louis is just wrong," he said. Ald. Fred Wessels pledged to introduce the fix as a separate measure, but French doubted the ability of the board to get it passed. "violate the Missouri Constitution by unlawfully delegating state power from the Missouri General Assembly." are "void in that they violate equal access to courts to every person and that justice be administered ‘without sale, denial or delay.’ They add that the members and beneficiaries of FRS will have their rights constitutionally violated by the passage of Board Bill 12. They add that the members and beneficiaries of FRS will have their rights constitutionally violated by the passage of Board Bill 12." A hearing for the suit is scheduled for Thursday, June 14 in front of Judge Joan Moriarty. Judge Bryan Hettenbach was originally assigned to hear the case, but recused himself. Mayor Slay's chief of staff, Jeff Rainford, says the administration is prepared for the lawsuit and believes it's on solid legal footing. "The president of the Board and others have said don't do this, you're going to get sued," Rainford said. "What they're basically saying is, anytime anybody wants to sue you because they don't like what you're doing, don't do what they want you to do." He says while the lawsuit may delay expected savings, the 2013 budget is built on the assumption that the reforms do not pass. Though they had no legislation to officially consider, members of the Public Employees Committee of the St. Louis Board of Aldermen spent almost three hours today discussing proposed changes to the pension system for the city's firefighters. There’s been a temporary delay in a new skirmish between the city and its fire department. Ald. Matt Villa has held a bill that aims to change the way certain benefits for firefighters are funded. 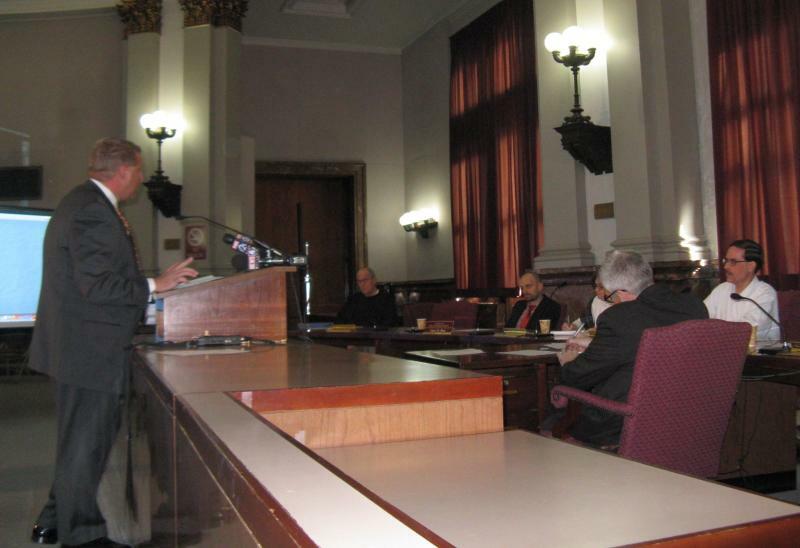 Though they waited until the last possible minute in the current session, the St. Louis Board of Aldermen has approved a measure that lays the ground for reforms to the pension system for its firefighters.